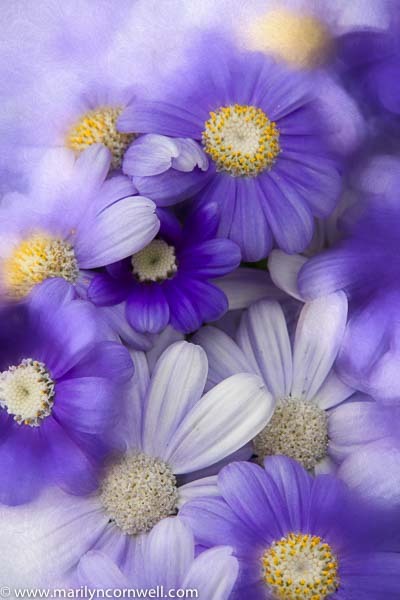 Aren't there such interesting colour variations on this daisy plant, Cineraria. These are pot plants this time of year, heralding spring with their delicate little mounds of scented daisy blooms. Daisies are one of the happy flowers of childhood. The website daisyparadise.com tells me there are over 1500 genera and 23,000 species and that the daisy family is the largest family of flowering plants. "The Daisy is pretty and versatile. Daisies are hugely popular too! There is a wide range of plants belonging tothe Daisy family or Compositae (Asteraceae). There are annuals, perennials, shrubs and even trees. Some are hardy while others are tender. In fact, everybody should be able to find a plant to their taste within the huge daisy family! Some well known plants like Osteospermum, Chrysanthemum, Gerbera and Calendula belong to the Daisy family. Some are less common, such as Tithonia, Inula and Xeranthemum. Just use the Daisies A to Z menu at the top of this page and click on the daisy of your choice." One of the great floral plants in the Niagara greenhouse trade - the Gerbera - is included in this family.